The life story is that of a raconteur, a British, a soldier, a gentleman, an actor. The sense of humour is the best kind of British humour. The name dropping is not callous (would you rather not find out his stories about his friends, Bogie, Errol Flynn, Noël Coward, Tyrone Powell, Sinatra, Ida Lupino, Elizabeth Taylor, Joan Crawford, Greta Garbo, Cary Grant, Laurence Olivier, Vivien Leigh, etc., or his honest, never defamatory, opinion about the big Hollywood studios bosses?). The sense of style ensuing from the storytelling has nothing to do with the sartorial wit (although he had that to spare, too). The honesty is that of a man who counted good luck and good contacts as big part of his path towards a career in the movies. The view on Hollywood stretches from its Golden Age to the radical transformations that arrived with the advent of television and it is well worth the reading. 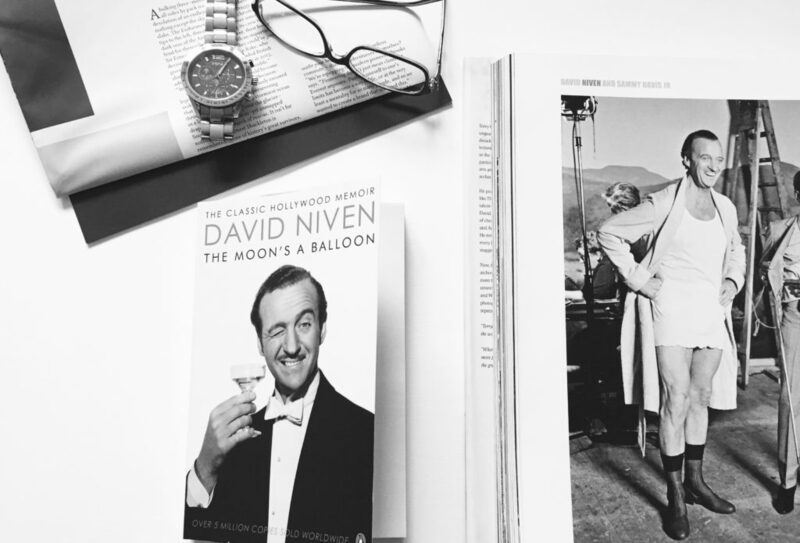 Here are a few take-away words from David Niven’s autobiography, The Moon’s a Balloon. ‘Good morning, Mr. Niven,’ said the doorman, saluting deferentially.